After a 10-month journey, NASA has confirmed that the MAVEN spacecraft has successfully entered Mars’ orbit. NASA’s Mars Atmosphere and Volatile Evolution (MAVEN) spacecraft successfully entered Mars’ orbit at 10:24 p.m. EDT Sunday, September 21, where it now will prepare to study the Red Planet’s upper atmosphere as never done before. MAVEN is the first spacecraft dedicated to exploring the tenuous upper atmosphere of Mars. 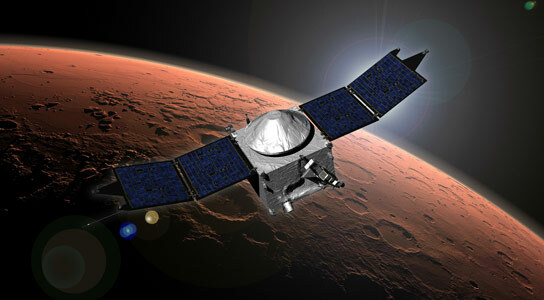 Be the first to comment on "MAVEN Spacecraft Successfully Enters Mars’ Orbit"